Tag line: "And now the Son of Robin Hood...dashing lover...adventurer...outlaw!" Eight years after Errol Flynn saved England from tyranny in The Adventures of Robin Hood, audiences were once again whisked away to Sherwood Forest for this 1946 movie, and even though it wasn’t a direct sequel to the earlier film (The Adventures of Robin Hood was produced by Warner Bros., while The Bandit of Sherwood Forest was a Paramount production), there’s enough adventure and excitement in this latter entry to ensure it’s every bit as entertaining as the original. Several decades have passed since Robin Hood, now known as Robert Earl of Huntingdon (Russell Hicks), faced off against King John and the Sherriff of Nottingham. Alas, the country finds itself in peril once again when the Regent, William of Pembroke (Henry Daniell), abolishes the Magna Carta and attempts to seize control of throne of England. As he did so many years earlier, Robin gathers his Merry Men together, including Little John (Ray Teal), Friar Tuck (Edgar Buchanan) Allan-A-Dale (Leslie Denison) and Will Scarlet (John Abbott), to combat this newest threat. Realizing they need a younger man to lead them, Robin also sends for his son, Robert of Nottingham (Cornel Wilde). Aided by both the Queen (Jill Esmond) and her friend Lady Catherine (Anita Louise), Robert does what he can to defeat the ruthless Regent and restore order to the land. 3.02+the boy King (played by Maurice Tauzin). Yet, much like Errol Flynn had done in the 1938 film, Cornel Wilde steals the movie as the charismatic son of Robin Hood, a master with the bow (the archery scenes, during which professional marksman Howard Hill stood in for the actor, are simply amazing) who also manages to win the heart of Lady Catherine (among other things, The Bandit of Sherwood Forest is an effective romance). Looking as if he’s having a great time, Wilde brings an energy to The Bandit of Sherwood Forest that resonates in practically every scene. 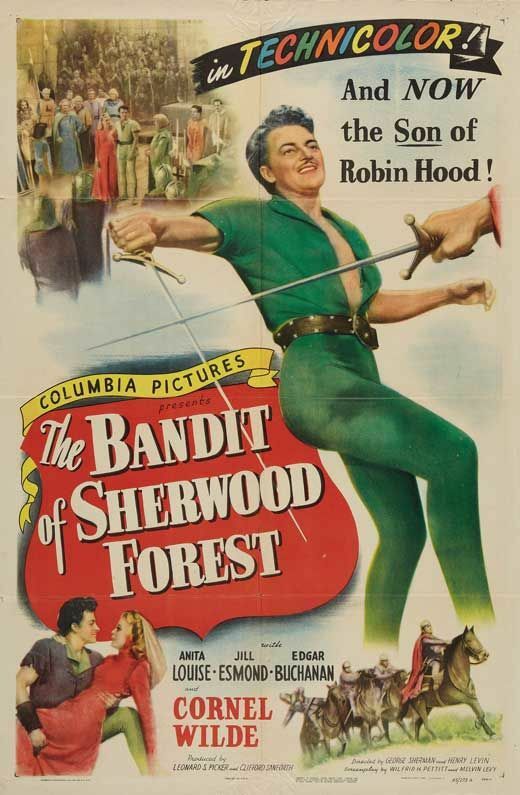 Those who enjoy The Adventures of Robin Hood should do themselves a favor and check out this nifty little 1946 film. It may not be the classic the 1938 movie is, but as follow-ups go, this one’s a tremendous amount of fun.